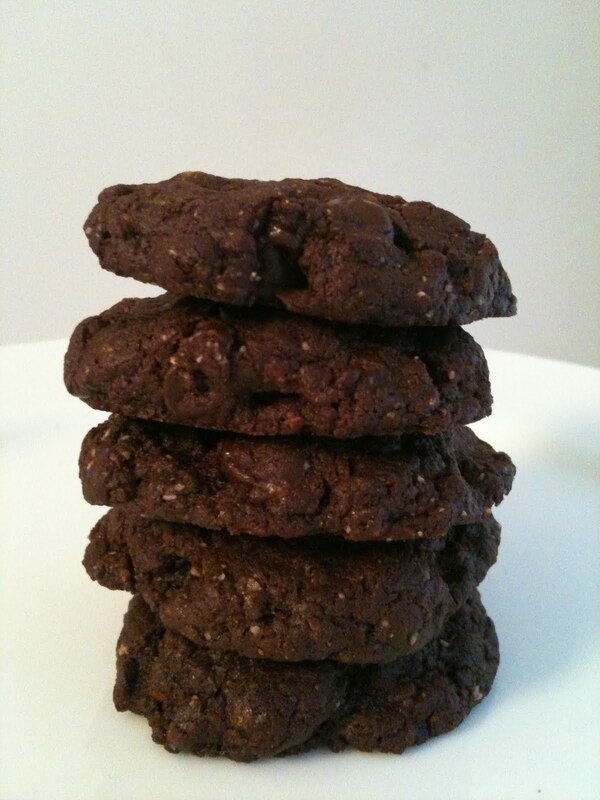 Today I made my first-ever batch of vegan, gluten-free Double Chocolate Buzz Buzz cookies. I was a bit nervous about the endeavor, but I needn't have been -- it was simply a matter of making some substitutions and adjustments, and baking the cookies at a higher temperature. I still have some work to do before the modified cookies could pass for the originals -- the flavor is virtually identical but the texture is not -- but I think I can share the recipe in good conscience. Speaking of which, these are not healthy cookies by any means, nor are the originals! - Increase baking temperature to 350 degrees F.
- Substitute 2 chia "eggs" for the 2 chicken eggs: stir together 2 tablespoons chia seeds and 6 tablespoons water in a small bowl, and let the mixture sit until it becomes gelatinous. - Reduce white sugar to 1/4 cup. - Flatten the cookies slightly before baking. Note: The chia "eggs" are quite crunchy, and the coconut oil quite greasy, so I'm going to experment with applesauce and flax meal. - As instructed above, flatten the cookies slightly before baking. Special thanks to Katie at Sweet Tater for the chia eggs recipe. This makes me happy! I'm exicted to try. Thanks!!! !